Did you know Roswell was still a thing? I was surprised this morning to find that it was being written about at the UFO Conjecture(s) blog, in response to it being written about in Roswellite Kevin Randle's blog. What could they possibly be blathering about? What new Smoking Gun could there possibly be? And, anyway, didn't I already write about this? 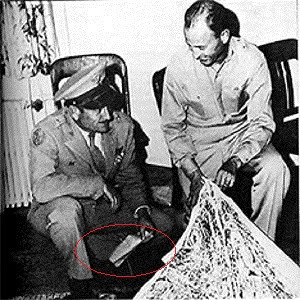 Turns out this week's chatter concerns the Ramey memo, that little piece of paper that "proves" that Air Force General Roger Ramey wrote to his superiors telling of a crashed disc and the "victims" of the crash found outside Roswell. Why the hell is Ramey holding that memo in the first place? That's what I can never get past. Why would this General be carrying around such a sensitive document, one that details his role in an ongoing government cover-up, and carrying it so obviously, so casually, so carelessly, while a photographer from the local paper was taking pictures? On a more basic level, why would that memo have ever been taken out of Ramey's offices ever, under any circumstances? I don't care how you try to explain it, there is no possible reason for Ramey to have been holding that document in a public space in such an open and casual manner with a press photographer snapping pictures if it contained any sensitive information at all. Good thing this Air Force General knows how to conceal sensitive documents when pictures are being taken. That's a real problem with so much of UFOlogy: people get crazed with something they think they see, but never ask -- or answer -- the obvious question about why that thing they think they see is even visible in the first place. I'm not saying I think I know what the Ramey memo actually said, or that I can prove it wasn't a sensitive document about a crashed disc and alien crash victims. But I am saying that before it can be accepted as evidence of anything, someone needs to explain why it's in the picture in the first place. Which, of course, no one can. It's the weekly shopping list his wife gave him. He's holding on to it so he doesn't forget to buy the bread, milk and sausages . . .
Now while the memo in all probability has nothing revealing to say, it would not be the first time a government official was photographed with classified documents. No doubt that's true, but it doesn't prove anything. You're being far too rational and logical, here, when you know so much of Ufology hinges on being irrational and illogical. Why, just last night I heard someone state that he knows for sure (he has proof that he can't share) that UFOs are the vehicles of a superior race older than Homo sapiens living deep underground on Earth. What logic is going to counter something like that? It amazes me that all this blathering still goes on about Roswell. I refuse to listen to podcasts where this subject is discussed. Now you see why ufology is held in such poor regard. They're still bickering about an event from almost seventy years ago. purrlgurrl, are those the people who get in and out of the earth through the big holes at the North and South Poles?? Maybe I can look for them when I'm in Antarctica next month! The current effort is merely to definitively close the book on the Ramey memo controversy. Yes, it is highly unlikely the memo is of any significance. However, some researchers who are not on the lunatic fringe of ufology have made it an event of potential significance for years by seeing tantalizing words that may or may not actually be there. So why not use the latest technology to put the very real controversy to rest? It is highly unlikely that Ramey is holding a smoking gun, but it is not absolutely impossible. It sounds like the Deros and Teros of Richard Shaver fame. Mark O'C . . . You know if you find that big aperture, we want you to bring back irrefutable evidence. Meanwhile, pet a penguin for us and don't freeze your patoot off. I often find you have a pretty superficial knowledge of various UFO-related issues, and an overly dismissive, jokey attitude, Mark. The point of the new scanning and use of more modern deciphering software on these somewhat higher resolution scans of the original negatives is to try and discern more clearly what parts of the Ramey memo might actually say. If it can be reasonably confirmed the memo says, in one part "victims of the wreck," and "disc," that would strongly suggest the invalid claims for Mogul flight #4 are thus discredited, the USAF lied in their 1994 and 1997 "case closed" whitewashes, and the term victims suggests there may be more to the case for Roswell than you seem capable of even understanding or accepting. Using Rich Reynold's site and related postings for your initial source for info on this controversy simply confirms that, since he despises Randle. You therefore discredit yourself by such ignorance and bias. True. The point of stating that people have been photographed with confidential documents wasn't to try to show the memo proved anything. Just that your argument on why someone would have such a document with them is starting on a false premise that people don't. Never assume what people are meaning, rather what are they saying. > I don't know how anyone can claim to see anything at all. I second that. The characters look like crushed spiders. To read the memo, we need another spell of "slides" software magic. Until we get that, all interpretations are mere projections.